Top Notch Material: Save Big on the Best Brand Name Backpacks at eBags! 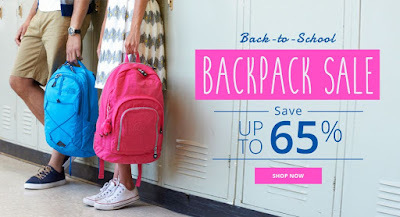 Save Big on the Best Brand Name Backpacks at eBags! School has started back for most of us, but a few lingers have not started yet. If you are scrambling to get it all together check out eBags! They offer any type of backpack your child might want and sent my son the JanSport High Stakes backpack! This bag is super cool, has amazing colors and is perfect for my astronomy loving kiddo! This bag is only $39.90 at eBags, and anyone that knows JanSport quality knows he will be carrying it for years to come!! I had one JanSport all four years of high school and my mom never had to buy another! The classics are available at eBags for less than $30, so instead of buying one backpack for $15 that tears half way through the year, you can buy this and have it last several years! eBags have all of the popular brands like JanSport, Ogio, Tumi, The North Face, Swiss Gear and more, and is now offering 20% off purchases using the code: CLEAROUT, and many backpacks are already reduced by 65%! So, even if you kid has started back to school already and you bought one of those cheaper backpacks that you know will not last through the year....now is your chance to get a quality bag for a LOT less and save yourself a lot of money in the future.